From the top of Federal Hill, you can see a lot. 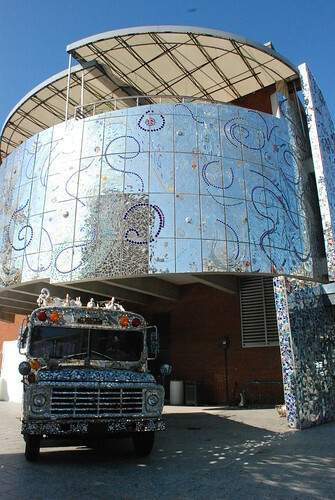 The American Visionary Art Museum was right next to the hill. Like when I say next to it...it was at the foot of the hill. I could have rolled down the hill and onto the museum's grounds. 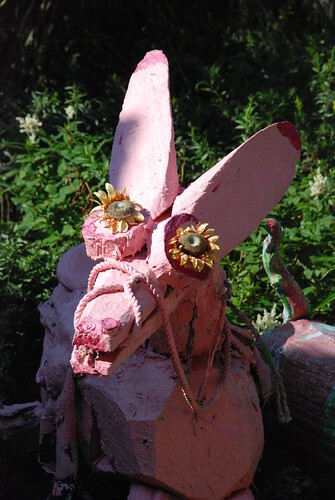 What caught my eye was the amazing mozaic, glittering in the sun. I am attracted to sparkly things and bright colors...I had to get a closer look. Was this a restaurant or a museum or both? Well, as it turned out, it is an art museum with a cafe on the top level. One of these days I will have to make a return visit and check out the cool things inside and eat up at the cafe. I didn't have a lot of time so decided to check out what was outside. 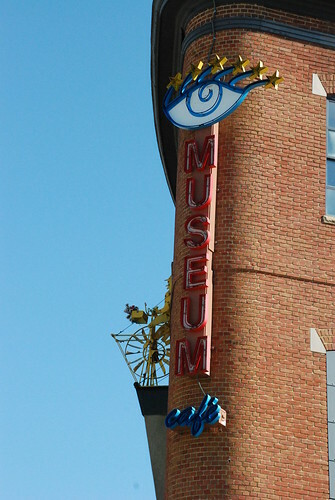 Admission to the museum is $15.95 for adults, a very reasonable price. However, I'd want to get my full $15.95 out of my visit and really get a chance to linger at their exhibits....if they are as cool as what is outside, I think I could spend several hours there. 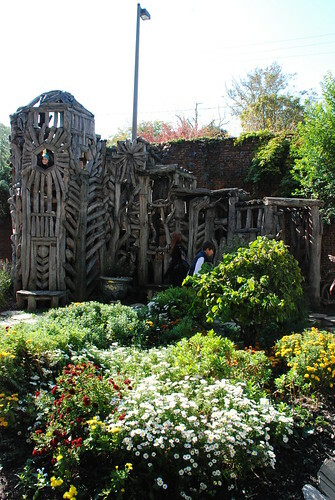 They are open Tuesday through Sunday 10 a.m. - 6 p.m.
Is this not a fantasy garden? 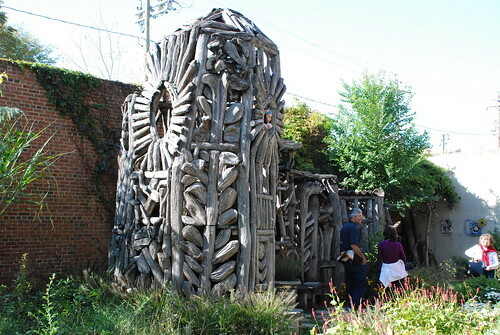 That "play house/tree house" is so cool. If I were a kid, I'd embarass my parents and immediately take up house and start playing pretend. I just imagine tree nymphs and faeries all over this garden. The detail of the house is just amazing a true work of functional art. 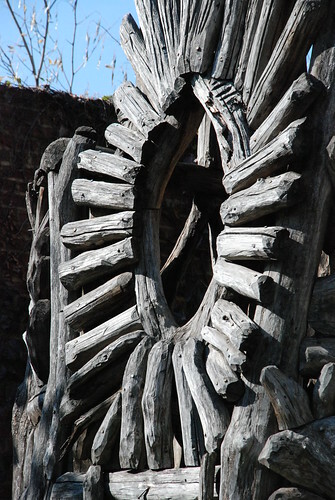 Now I just loved, loved, loved this sculpture! A bird and her nest. 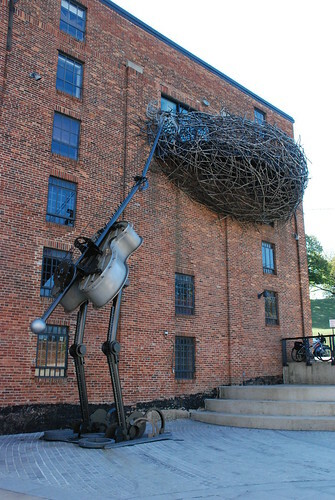 Talk about an industrial size bird...and a musical one at that. Here is her beautiful egg. 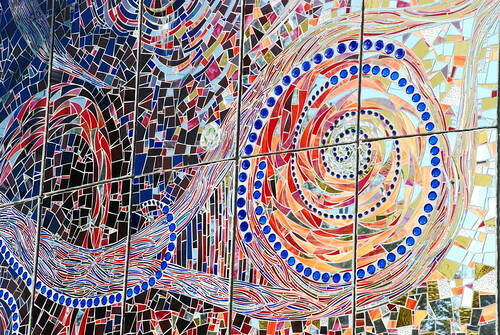 I love these glass mosaics. It reminds me of a place near my home. Maybe some of my homies may remember the house on Hayes Avenue up by Speigal Grove where they had these towers of cement with pieces of beautiful glassware, plates and mirrors pressed into them. I'm sure many adults may have thought the elderly couple's "glass and cement garden" an eye sore but I thought it was the lovliest thing. I always wanted my mom to stop to let us look through the chainlink fence at the sparkling, colorful rocks. 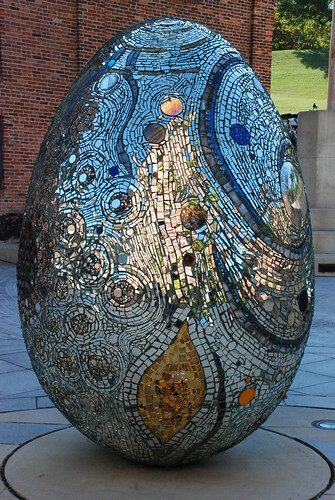 The elderly man's works were no comparison to this egg or the mosaics around the museum buildings. 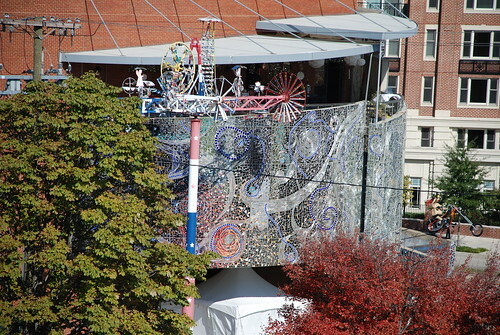 So back to the mosaic that caught my eye...oh, the balcony above is the restaurant. 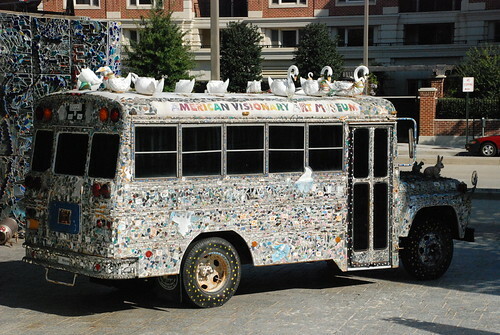 Now is that a school bus or is that a school bus?! Below, close-up of the outer wall mosaic. 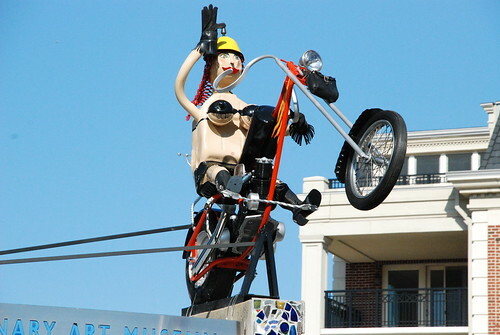 Biker chick is right over the entrance, you can't miss her. 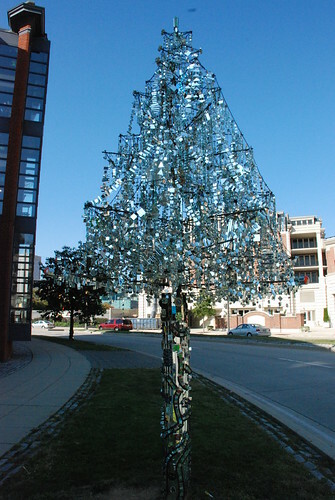 This glittery mirror tree is right in front of the main building. I can't imagine how cool this must look if it gets hit directly with sunlight. It certainly sounded pretty, tinkling in the soft breeze that afternoon. 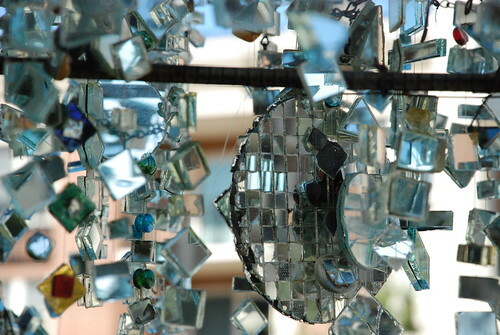 This is a close-up of some of the glass and mirror leaves on the tree. Now, if something can be judged by its 'cover', I have to think the stuff on the inside is pretty cool. The welcome mat for the museum was made out of brightly colored tooth brushes, so who knows what other fun, imaginative, out-of-the-box stuff is inside. 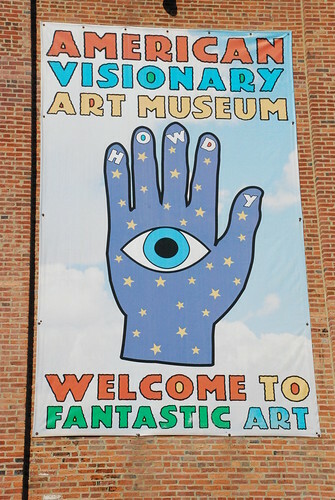 If you are in Baltimore, visit the American Visionary Art Museum...if you go, take me with you. I remember J-Lynn! I always paused to look into it.
.".may remember the house on Hayes Avenue up by Speigal Grove where they had these towers of cement with pieces of beautiful glassware, plates and mirrors pressed into them. I'm sure many adults may have thought the elderly couple's "glass and cement garden" an eye sore but I thought it was the lovliest thing." This stuff is amazing. I'm a digital and sound artist working in Ireland. We got nothing like this over here, is there any digital//sound art at the Museum? I love that stuf, Thank you for sharing it. This is the place where I share the things going on in my life such as travel, family events, interesting people I meet and things going on at the National Museum of the Marine Corps (where I volunteer). Writing and photography are ways that I process new things or events. Yes, there may be an occasional work vent or political/current event rant. That said, the views and opinions expressed here are my own and do not reflect those of any organization I may be affiliated with. The day to day, semi-normal life of a female Marine. What do you mean I don't call the shots?